The deadline is imminent for parents in England to apply for 30 hours of free childcare for their three and four-year-olds for September. It doubles the current 15 hours' allowance, with parents eligible if they both work and each earn less than £100,000 a year. Applications close on 31 August, and HMRC says parents who apply on that day can get a code to claim childcare. The code should be taken to the childcare provider or local authority. However, even if parents are eligible, they can only get the free hours if nurseries in their area can actually supply them. Many smaller nurseries say they cannot afford to offer the free time, while others say they will restrict the number of places they can provide under the scheme. And Neil Leitch, chief executive of the Pre-school Learning Alliance, which represents 14,000 nursery providers, told the BBC that the funding provided by the government to cover the extra hours was less than the cost of providing the childcare. But the government says it is investing more in childcare than ever before, with ministers saying the new scheme will make a positive difference to millions of families. There have been glitches with the Childcare Service website since mid-May, just after it was made live. Last week, Nicky Morgan, who chairs the Treasury Committee, said it must be improved. 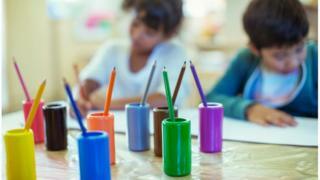 The website enables parents to access help with two new government-funded childcare schemes: a tax-free childcare scheme and the offer of 30 hours' free childcare for three and four-year-olds.